The Bridgeport Holiday Inn (I-95, exit 27A, then north on CT 25 to exit 2) and the Ramada Inn (I-95, exit 30) are two of the areas better motels. Try Copperfield’s, located at the Ramada Inn (I-95, exit 30) or LaFamilia Restaurant located on Pembroke Street (I-95, exit 28).$$ You’ll also find a few fast food restaurants just off I-95 at exit 25. You can’t stop in Bridgeport without a visit to the P.T. Barnum Museum (820 Main Street). It’s a 3 story museum with a 7,000 square-foot special exhibitions wing that houses two major shows a year. The Beardsley Zoo (I-95, exit 27 to CT 25) features 120 different species of animals. There’s also a New England Farm Exhibit and an indoor rain forest! The Discovery Museum (4450 Park Avenue) is a 90-acre art and science museum with a Learning Center and Planetarium. I-95 runs east-west through Bridgeport. Exits 25 thru 30 will take you to various locations within the city. CT Route 25 (I-95, exit 27) runs through Bridgeport north to south. Need more? Try these links for additional information about Bridgeport, Connecticut. Visit Bridgeport! Take a voyage of discovery! 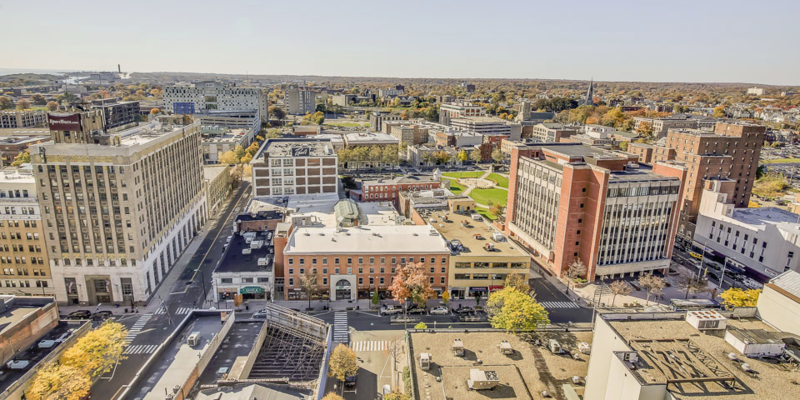 Connecticut’s largest city is, in many ways, a small town with a sense of community, neighborhood spirit, and traditional values. Your link to southwestern Connecticut’s largest daily newspaper. Try Ralph and Rich’s it is close to the Ramada Inn… much better.